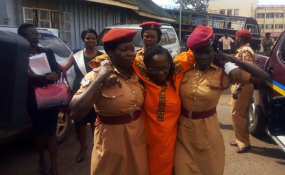 Buganda Road Court today (Wednesday) granted Dr Nyanzi a noncash bail of Shs10 million. Her sureties were also each bonded Shs10 million not cash. Earlier, Dr Nyanzi’s lawyers had told journalists that her case had been delayed because she woke up today morning feeling unwell. Dr Nyanzi is facing cyber related crimes slapped against her about four weeks ago by the State for allegedly referring to the person of President Museveni as a “pair of buttocks” on her social media posts. The State says that Dr Nyanzi’s reference to the person of the President is offensive.